That ubiquitous ubi solemnly embellishing the popular Pinoy halo-halo, may soon be lost, thanks to a culture that looks down on the hardwork and perseverance of ubi-farmers, being low class, dirty nailed slaves of the land. 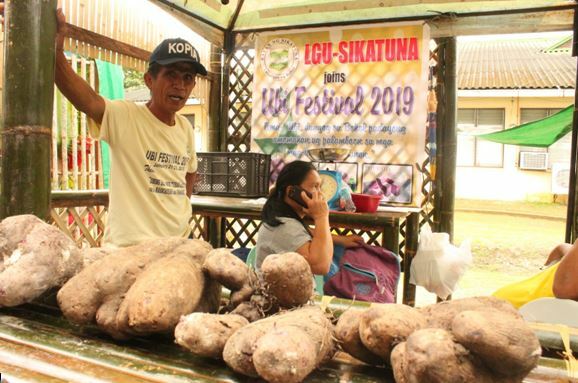 Bohol has gained over 200,000 kilos of ubi in the past year, according to data cited by the Office of the Provincial Agriculturist. The figure however is yet to be shown in the local markets as there have not been much of the 200,000 kilos, enough to flood the markets with the purple or the white yam. On the 18thUbi Festival here, there is enough reason to believe that ubi could possibly vanish in the next generation. Here for generations immemorial, ubi has endeared itself to Boholanos, that the crop sits on a pedestal along with some faint objects associated with the pagan animist faith. It is so defined in some family altars during the padogmak (harvest thanksgiving) which also coincides with the All Saints and All Souls day. But how did the ubi get there? According to scientific research, ubi(DioscoreaAlatasp) was said to be brought in by THE Austranesian cultures. But the natives have another story for this. A drought which lasted for months practically killed almost all the food plants. The natives found vines with traces of green or purple towards the roots, and they started digging it up. Out came the ubi, a food natives believed was provided by the gods of the forest and the gods of the land. And true enough, it is seasonal and survives towards the last months of the year. As it is, farmers who have not really been into the industry said the crop is just too delicate to be gambled in. But more importantly, a crop that has attained an ethno-religious elevation is not something to gamble on. Domesticated by the natives as a crop which they also introduced to the Spaniards and no sooner, the first ubi made its transatlantic crossing for Europe, to the galleon trades as a exotic product for Europe. Extensively cultivated from generations, over time, farm families tried to uncover the secrets to a successful pamanlin, anything that adds up to the efforts during harvest they secretly bequeath the folk knowledge on the manner of nurturing the crop, all also knowing that not all farmers are gifted with the hardwork, patience and the perseverance of a saint. Guarding the secrets like family heirlooms is understandable;with each family picking their own set of perceived beliefs and the resulting harvest. Cultivated in kaingin patches, ubi is grown from diced tubers, laid in especially dug hutok (holes) laid with a weave of dried leaves, rice straw, banana leaves and sometimes dried sargassum and burning refuse. And that is getting ahead of the story. This year, while the OPA reported 200,000 kilos more, farm technicians agree that young farmers, which are fewer, do not put the ubi among their typical options, for several reasons. Ubi farming is courting failure more than mastering the art of the unknown. And it entails a whole lot of sacrifice, which unfortunately is on bankruptcy levels among younger farmers. For how could one be as careless when even picking the ubi patch from a secondary growth forest or thick bushes has to be meticulously weighed. The slope must be considered, ubi thrives in areas where theire is sufficient drainage and water does not gather, this will rot the tubers, a plant disease farmers call as bonggak. Another consideration is that the patch must have tall bushes that can support the harug (trellis) where the ubi vines can crawl and hang. Primary among the consideration is an abandoned bamboo patch, as the bamboo roots age great aerators. Some also pick abandoned dwellings. Having selected this, the farmer leaves the area and comes back a few days later to bring an offering to the ‘owners of the land,” one that may be a whole boiled chicken without salt, a roll of tobacco, or anything that may endear him to the spirits so they would allow him to use the land. Days later, the farmer starts to clean up the undergrowth, carefully leaving some tall shrubs that can be the support for the katayan. Then he starts digging hutok (planting mounds), carefully digging out the rocks and stones that can wound the ubi. Each hutokcan be a foot in diameter and a foot deep. Mounds cango as much as over a thousand, or a few hundreds. After completing this, he leaves the farm to gather dried coconut leaves for the hampas. Each coconut leaf, he piles one on top of the other over the entire patch, making sure each mound is covered. This can mean hundreds of dried coconut leaves. And in one late afternoon after completing laying the dried leaves, he starts burning the coconut leaves from the lowest point of the patch. The fire crawls up and eventually consumes all the dried coconut, leaving some shrubs standing but dead. Burning assured all pests are killed and the ash helps treat the soil. By the next week, he starts the arduous task of digging out the soil from each mound, replacing it with a good amount of dried banana leaves, a weave of coconut husk, ash, sea weeds, and more dried leaves falling from the burnt bushes. Meanwhile, in his pinsa or kamalig where he keeps the aerated binhi, he picks the best kinds and uses the sharpest knife to cut diced sitt, about two fingers in width, which would go to each of the hutok. A sharp knife, accordingly would be less harmful as this does not bruise the seedling. A kilo of guha (diced sitt) can produce over ten kilos of ubi harvest, but that in fact is no stunning motivation to young farmers who would rather dream of some office over the toiling backbreaking and laborious ubi farming. On one late afternoon, the farmer, sometimes accompanied by the wife, treks to the patch and selects three mounds forming a tripod. He may or ask the wife to plant the first three mounds, carefully invoking the spirits to bless the seedlings, make it as big and possibly one that cracks when cooked. These that cracked are accordingly the sweetest. This is palihi. A week later, sometime in early May to early June, gathering all these diced sitts to the farm, he, along with a good number of neighbors who join the communal planting called hungos, trek to the ubi patches, this would be timed when the moon is full, and on the waning side and not just anytime. Some families forbid the farmers from talking too much during the planting, careful not to offend the wounded ubi, carefully laying two sits on the woven coconut husk, or dried banana leaves and then putting in the dug soil back, making sure it forms a mound to drain the rain and keep the sitt from rotting. When everything is planted, it is now the sole responsibility of the farmer to visit his ubihan and check if the seedlings start to germinate. The moment the green shoots emerge from the mounds, he starts putting up the trellis, which he leans upon the remaining bushes. When this is done, he makes it his daily mid-afternoon to late afternoon ritual to produce some smoke from burning grasses to drive away grasshoppers and pests that feed on the shoots. Ubi patches during these stages must not be approached, as soon as the shoots are touched, they sulk and won’t grow anymore. The same is true when it is raining or in the early mornings. As the ubi vines start to climb the katayan, care must be exercised so as not to touch them. If in case a harug falls, the farmer must slowly fix the trellis, careful not to wound the vine or affect other plants. Especially by August to September when the ubi would be at its fastest growth rate. By the last week of November, the farmer goes back to the palihi mound, digs the first three mounds using a wooden panlin, (stake used to dig the ubi)nadthen goes to the last mound planted and also digs the tuber. These make up the first harvest, and would be forming part of the altar offering, the rest goes to the padogmak, cooked into nilunaw, boiled or simply inanag and displayed uncovered in the padogmak table and left. Eating these can only happen after each family member returns after visiting their dead. There is the belief that the spirits and the souls of the departed, especially the elder farmers would partake of the food prepared on the padogmak table spread. The farmer gain returns to the ubi patch as soon as the vine’s leaves start to wilt and dry. This signals the pamanlin season. This is again another time for the hungos, a communal help scheme where every available farmer helps in the harvest. The harvesters also make sure they do not just stab the mound and wound or bruise the ubi, each harvest piled and the kids, carrying small bukag (bamboo baskets) gather these to a clearing where the owner keeps tabs of the harvest, an ash bowl on hand and immediately applying a thin paste of ash over the ubi woundor where there is skinning: this cauterizes the wound and stops the karma from the ubi. This also allows the ubi to be stored despite a would that could start the rotting, when unattended, This also goes as payment to the farmers joining the hungos. When all else is done, the farmer then picks the best harvest, this would comprise the next cropping’s sitt. And the cycle of life of the ubi starts again. And this is what the young farmers do not want to be engaged in.